Most of us do not like bitter gourd due to the simple reason that it has this bitter taste. When I was younger I totally refrained from it. When we were living in Malaysia, bitter gourds were so easily available in the wet markets that I decided to take a brave step and give it a chance. Well, I’ve never regretted it since. Now I am a big fan of bitter gourd dishes. I guess as we mature, our taste buds changes too! The good news is; I was taught by my mother-in-law to choose bitter gourd which has grooves that are far part as this will mean it’s less bitter. I also found out that rubbing some salt on the bitter gourd can remove some of the bitterness. So don’t shun away from this wonderful dish which is a definite keep. Slice the bitter gourd length-wise into half. Use a spoon to scoop out the spongy white centre and seeds then discard them. Rinse the bitter gourd and sprinkle with some salt to remove some of the bitterness. Leave for 20 minutes, then rinse off the salt. Cut into thick slices (about 3/4 inch), set aside. Rub a tablespoon of salt on the pork ribs and leave them for about 5 minutes. Then rinse the pork and set aside. 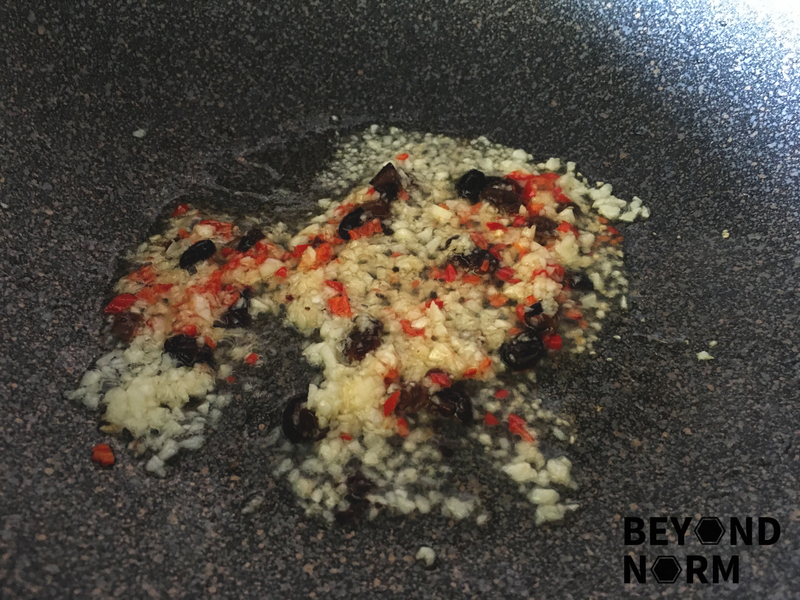 Run the fermented black bean through water if it comes coated with salt. Then roughly smashed the beans and set aside. In a wok or pot, heat up the oil. 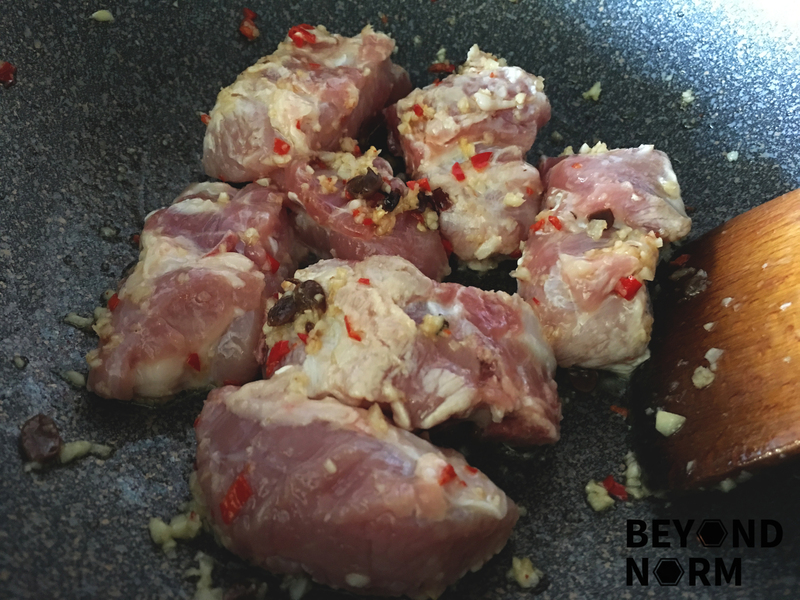 Add the garlic, fermented black beans and chillies and fry till fragrant. Add in the pork ribs and fry until all the pieces are seared and coated in the sauce. Add a small cup of water and fish sauce/soy sauce and sugar and bring to a boil. 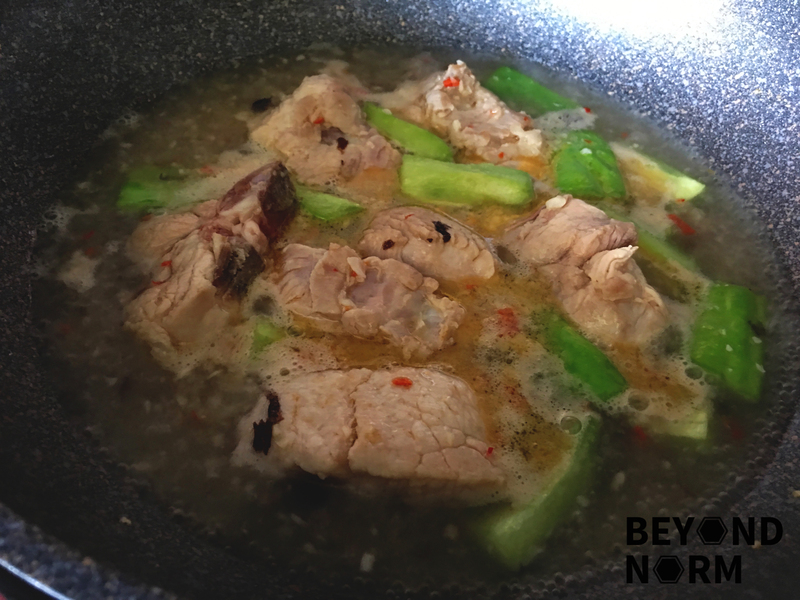 Reduce heat, cover the wok and let the pork simmer for 35 to 40 minutes or until meat is tender. Then add the bitter gourd and simmer for another 10 to 15 minutes (depending on how crunchy/soft you want your bitter gourd). At this juncture, if the water level is too low, add some water. 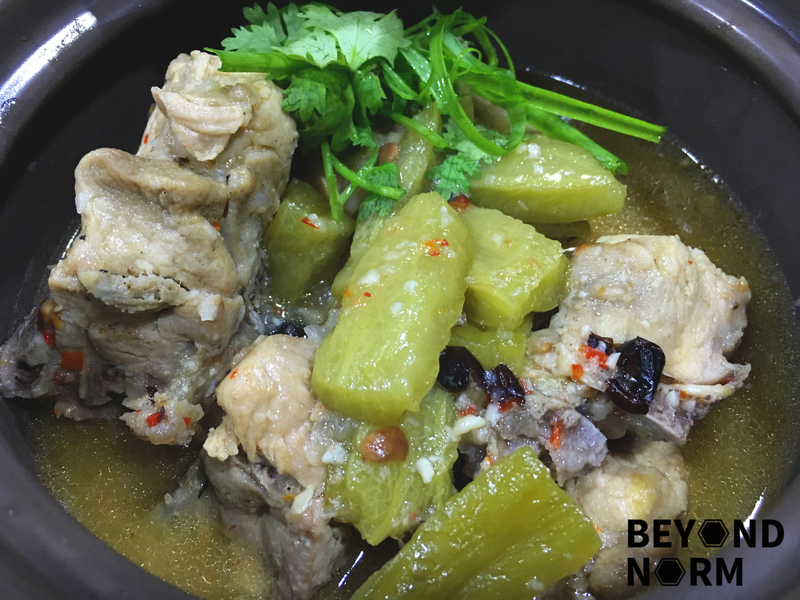 Dish and serve with steamed white rice. You can thicken the sauce with cornflour. 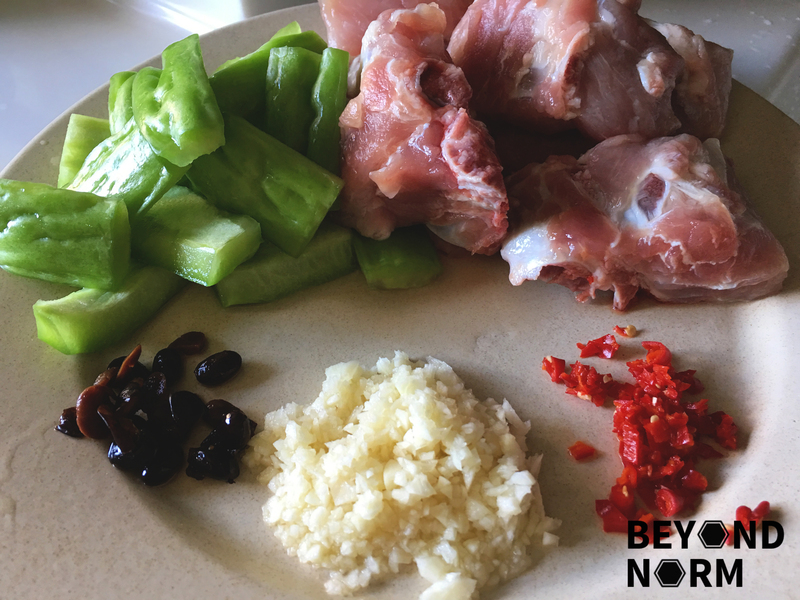 Cut down the number of chillies and/or deseed the chillies if you do not want the dish to be too spicy.